If you are interested in spells of magic you can do a google search and find plenty of free black magic spells, white magic spells, and information on pagan magic, Wicca and the occult. Some sites have thousands of spells available that are contributed by the forum members. There are spells to do everything from sleeping better to shrinking one’s waist. Whether a particular magic spell actually works as intended, is questionable but even weak spells or free ones allow a witch to center and focus on what she wants in her life. The positive and focused thinking involved when preparing for and casting a magic spell can be very powerful indeed. A strong will can be more powerful than any magic spell that exists. A magic spell is an incantation, charm or set of words either spoken or unspoken, that invokes a magical effect. Spells usually involve the use of language and phrases in the form of prayers, spells, songs, blessings or chants. Those who believe in magic view spells as more than just communication. Witches believe that there is inherent power in these words for those who understand and believe them. Magic is magic but some people believe that some magic is inherently white and some magic is black. White magic usually refers to spell that are of the healing and helping variety. These spells usually center around positive desires that cannot possibly hurt anyone. Examples are spells that cure, heal, improve health, enhance relationships, enhance fertility, find true love or bring good luck. Black magic refers to spells that have inherently selfish purposes. They might be viewed as evil if the intention is to hurt someone, curse someone or put a hex on them. Some black magic spells involve the invocation of evil spirits for narcissistic purposes. Such spells are often referred to as sorcery or devilry. Contrary to popular belief, Wiccans are not particularly interested in black magic or evil spells. Most Wiccans stick to positive enhancing spells that are designed to protect them, family members, friends, pets and people from harm. The rule of three (also called the three-fold law of return) is a tenet of Wiccans that predisposes them away from evil spells and black magic. The law of three fold means that whatever energy a person puts out in the world will be returned to that person three times. This is a strong belief that Wiccans hold dear. Therefore, why would they cast evil spells to dole out harm knowing that evil may be returned right back to them three times three times over by such karma. Tarot cards while often used for game playing purposes, have been adopted and revised by witches for occult purposes rather than game playing. It’s been said that tarot cards can predict your future. The cards themselves are not magic however tarot reading revolves around a belief that the cards can be used to gain insight into the past, present and even future situations. Some witches belief that the cards are guided by a spiritual force while others belief that they are used to tap into ones own consciousness. Many witches offer fortune telling services. A witch can claim to be able to predict information about a person’s life so that the person can understand events and act accordingly. Again not magic however it is believed that by invoking deities or spirits that information can be gleaned so as to guide a persons behavior based on that divined knowledge. The purpose of fortune telling is similar to that of the practice of divination. Divination however involves religious rituals to invoke deities or spirits, while fortune telling is more informal and usually meant to make simple predictions. Popular culture has made fortune telling more entertainment based. For example, one might get their fortune read from tarot cards or a crystal ball at the local fair. Such fortunes usually involve the teller gleaning information from the client using their own dress, personality and comments as clues. The fortune teller makes use of the clues to render fortunes and predictions and insights that the client may not have considered prior. Numerology is utilized by certain witches to glean information using counts or measurements such as one’s birth date. Some witches believe that certain numbers are luckier than others. For example, many believe that good luck comes in pairs and that even numbers are luckier than odd. 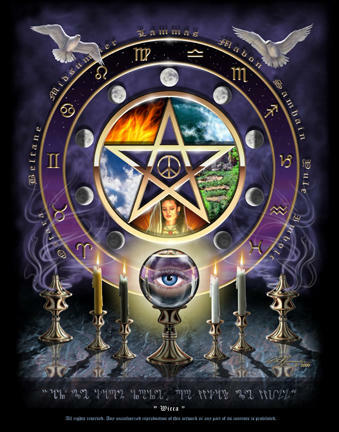 Witches can place importance on birth-dates, astrological signs, and the changing of the moon. Astrologers believe that each number from 0 to 9 is ruled by a celestial body in our solar system. While not magic spells per se, some witches utilize information gleaned from relevant numbers and dates and moon cycle to understand events and even predict or change their outcome using numerical information. In Wicca and other forms of neopagan witchcraft a coven is a gathering or community of witches. This is similar to a congregation. The witches gather together to worship, celebrate, cast and share magic spells. The number of witches in a coven varies with thirteen being the ideal coven size. While democratic in nature, a coven is often led by a high priestess or priest. Covens are even created online where witches can share magic spells and other information. For more about magic spells including free spells and ideas, click the desired tabs under the Magic Spells heading categories. Enjoy!